At American Paper Optics, it's our job to TOY around with your ideas and take them to the next level. For the last 20 years, American Paper Optics has been one of the largest suppliers of 3D glasses and lens material for toy companies around the world. 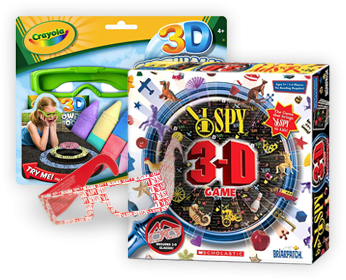 Whether it's 3D glasses for a puzzle or a 3D viewer for a McDonald's Happy Meal toy, American Paper Optics manufactures the best 3D solutions for any and all of your 3D toy needs. With everything going 3D these days, don't be left flat! Call American Paper Optics today and find out how you can take your toy or game to the next dimension.